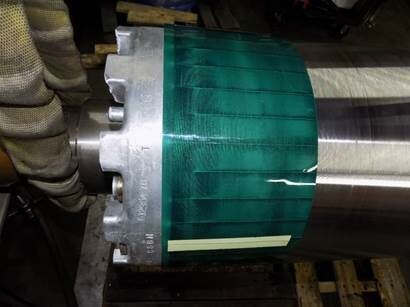 Rotor from a CVHF1280 centrifugal chiller disassembled during an overhaul. 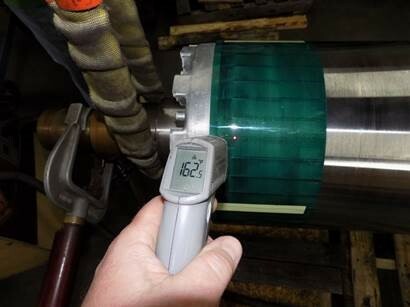 Testing at Xcel Hermetics determined multiple open bars due to overheating or defects during the manufacturing process. A magnetic film is used to determine if there are breaks and imperfections. A current is passed through the rotor and the corresponding magnetic field should produce defined lines in each bar through the length of the rotor. In this instance there are multiple breaks, corresponding to “breaks” showing up in the magnetic film and overheating. Thermetrics Corporation has factory trained technicians from the three industrial chiller manufacturers with the expertise and equipment to make any chiller repair.